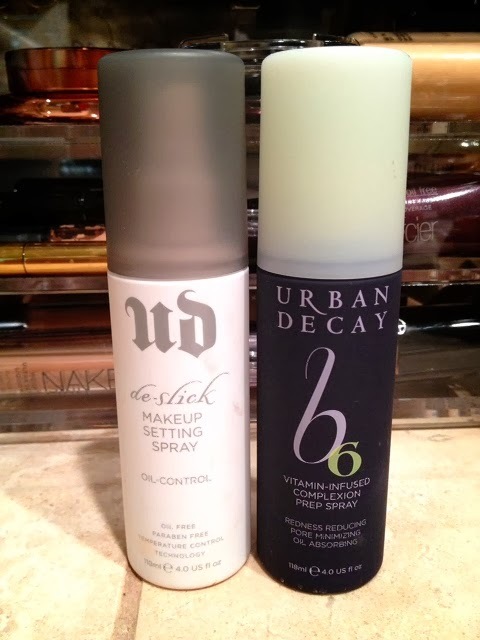 I'm sure a lot of you already know about or own Urban Decay's De-Slick (oil-control), All Nighter (long-lasting), or Chill (cooling & hydrating) Makeup Setting Sprays that you use AFTER you've applied your makeup. I use the De-Slick for my oily skin and my makeup doesn't budge! Now they have B6 Vitamin-Infused Complexion Prep Spray that you use BEFORE you put your makeup on. "This scientifically advanced formula contains the first patented, stabilized form of topical vitamin B6, which absorbs oil, minimizes pores and reduces redness. Spritz it on any time of day to hydrate, prep and soften your skin with vitamins and antioxidants. Use it in the morning to prep and “wake up” your skin, during the day to refresh your skin (without messing up your makeup), or at night before your treatment." And there ya have it! Now who doesn't want all those wonderful things for their skin?! Makeup finger prints included because - YES - I actually use the products I review! Do you still use a regular primer with this as well? ?